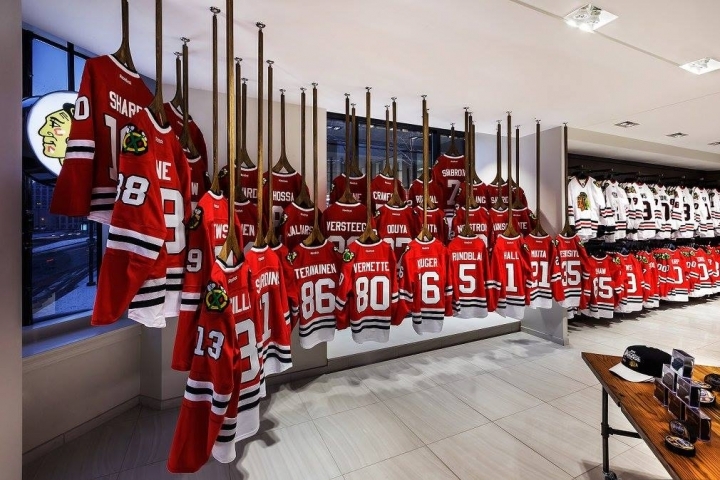 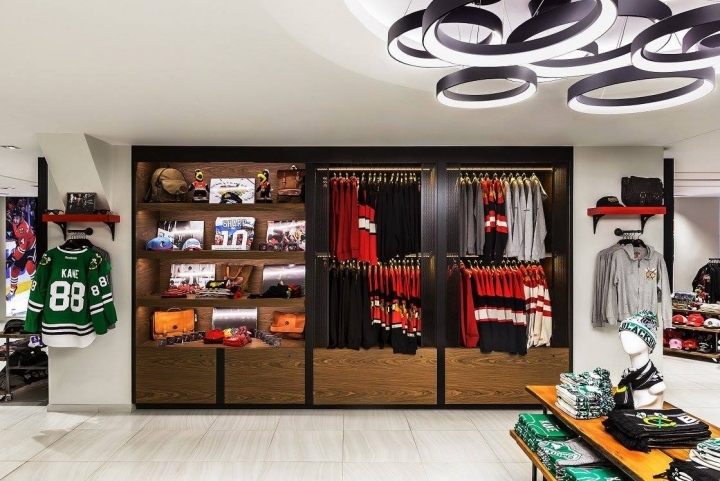 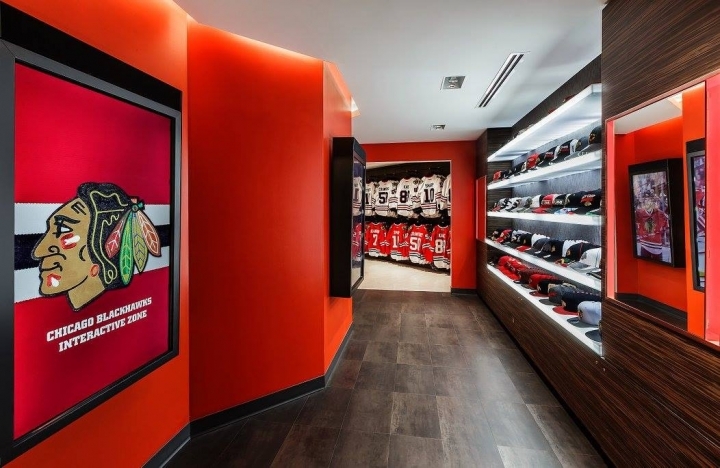 When planning a new flagship location, this year’s Stanley Cup champions, the Chicago Blackhawks, recruited Chipman Design Architecture to create a polished team store, plentiful in unique and immersive in-store experiences. 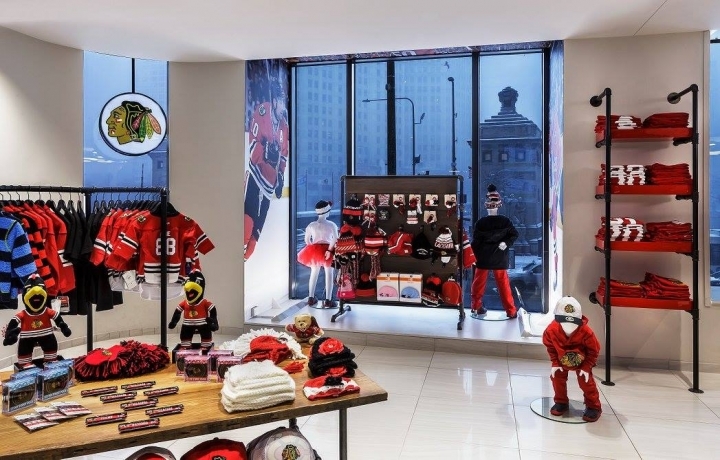 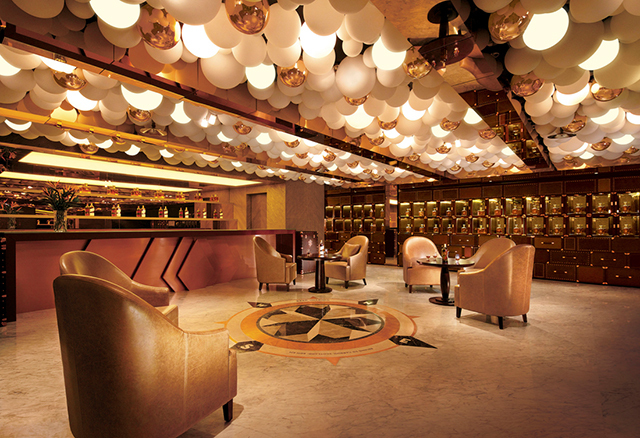 Contained within a historic art deco-style high rise on Chicago’s Magnificent Mile, the location was a clear fit for the store, but presented distinct challenges. 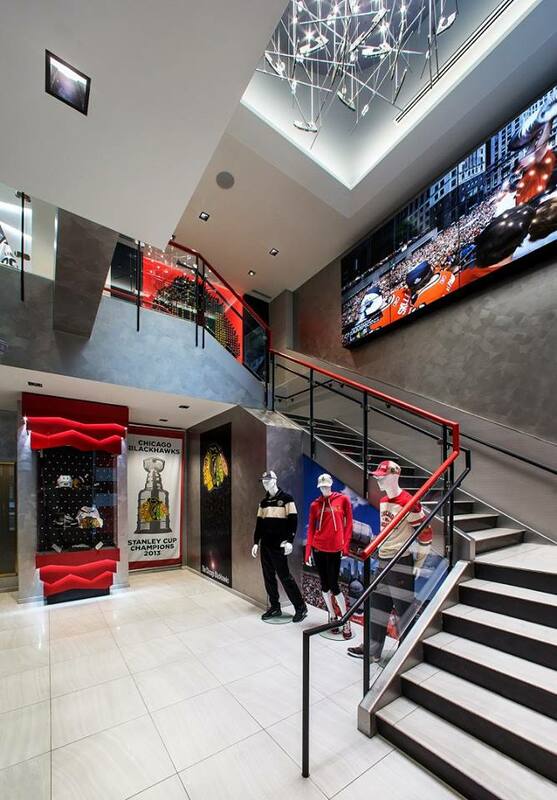 Although five times larger than the team’s previous flagship, the new store was limited to a mere 1000 square feet. 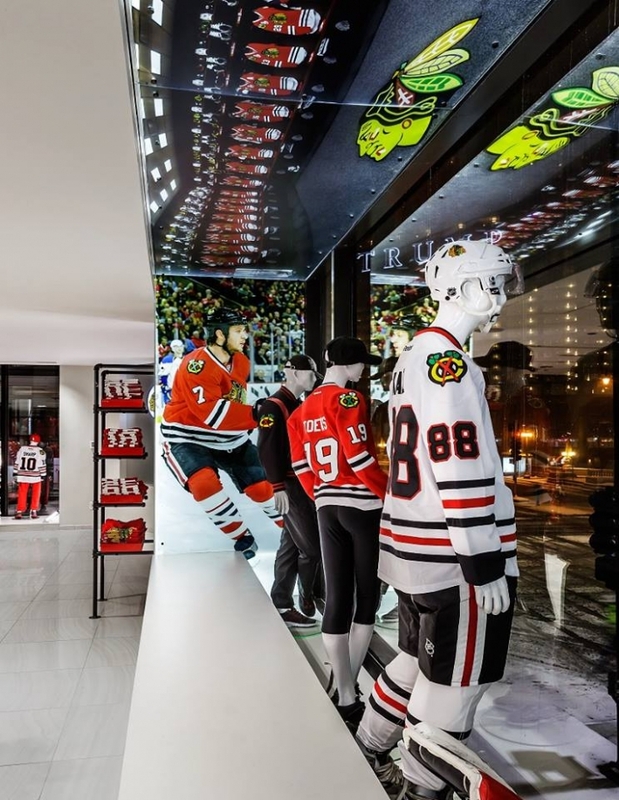 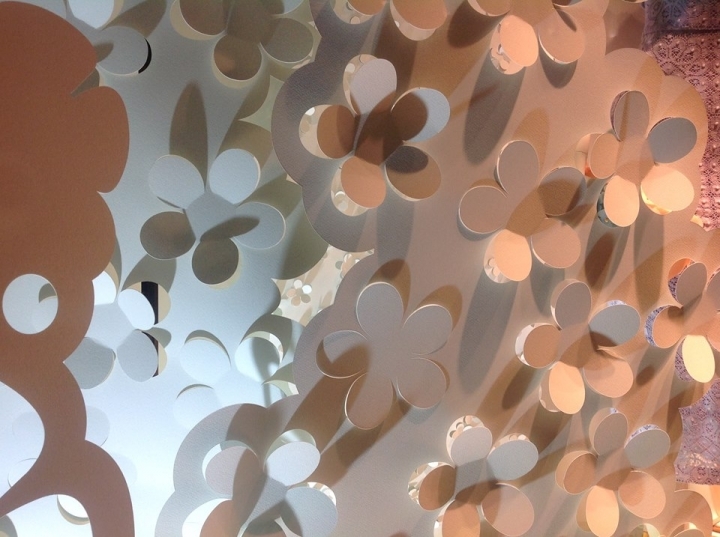 Historic district limitations also meant designing window displays that were relatively modest, as not to detract from the building’s façade. 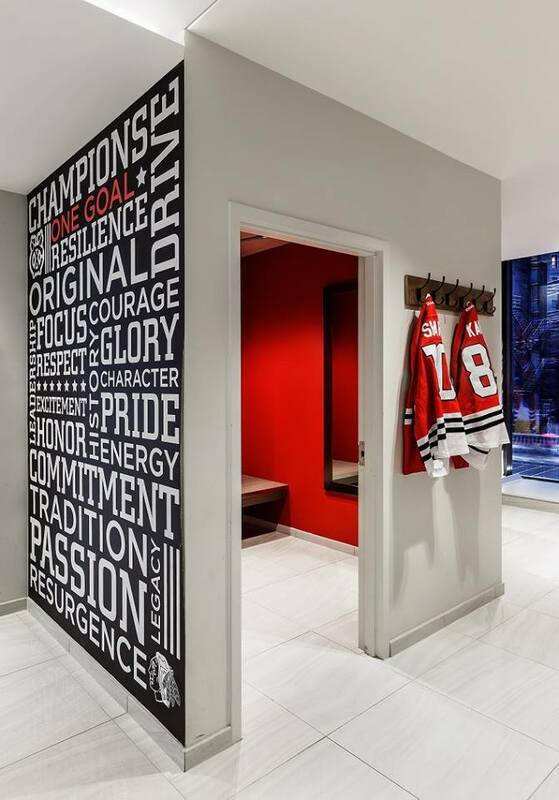 To obtain a high-end look, the design team sourced materials that looked authentic, but would provide extended durability and fit into their limited budget – for example, the porcelain tile that forges the crisp white flooring that resembles the sport’s signature icy rink. 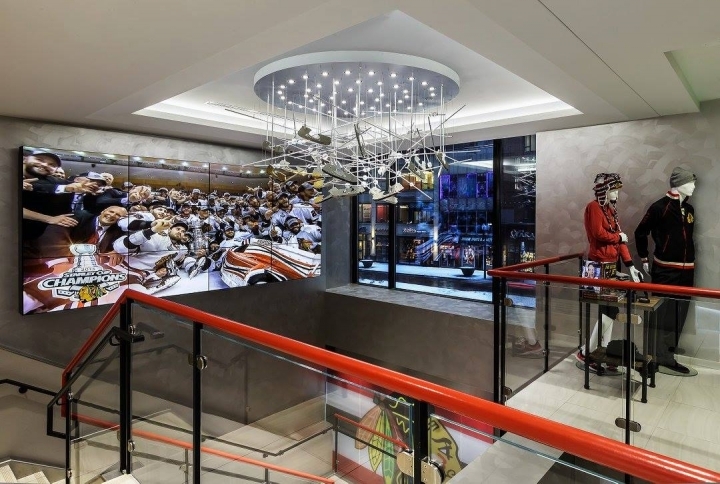 Fixtures and sculptural elements, including an ice-skate chandelier, were custom made to create one-of-a-kind memorable features. 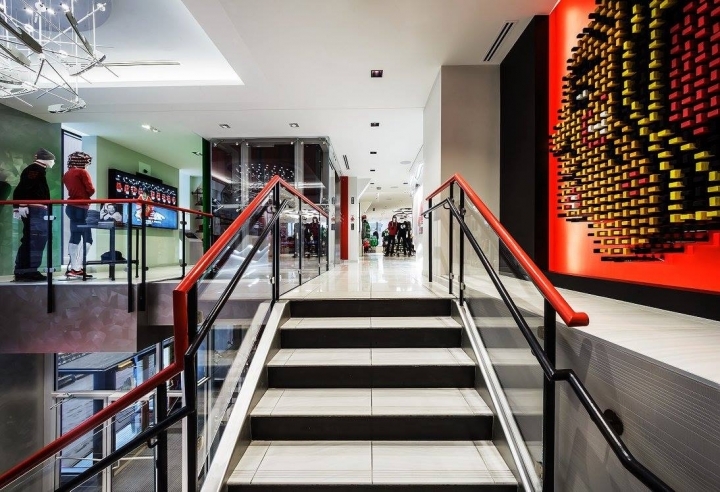 The Blackhawks’ logo, crafted using the ends of actual hockey sticks, greets customers on the entry stairway up to the store’s second floor. 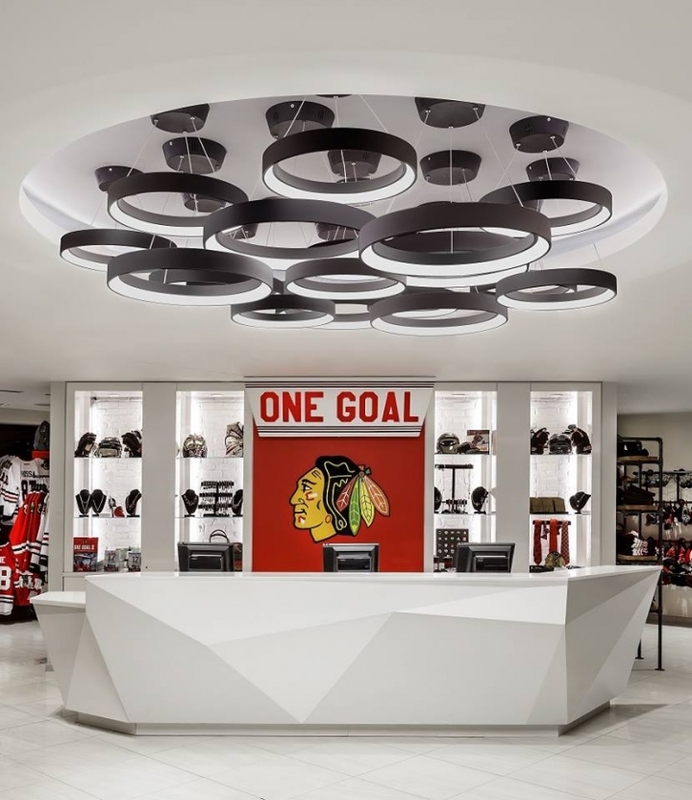 “Those sticks are sponsored by local leagues in the Chicago area, reflecting the team’s generous connection with the community,” says Jay Miranda, design principal, Chipman Design Architecture. 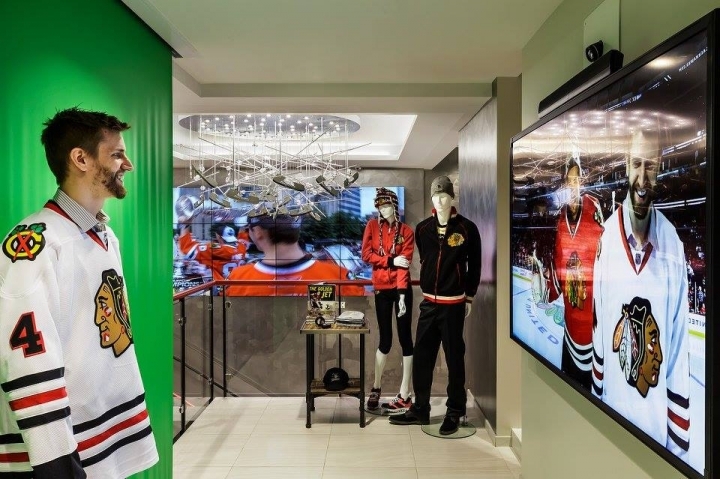 Shoppers get the ultimate team experience via the store’s interactive features, including a touchscreen featuring a camera and green screen that enables fans to place themselves in the action. 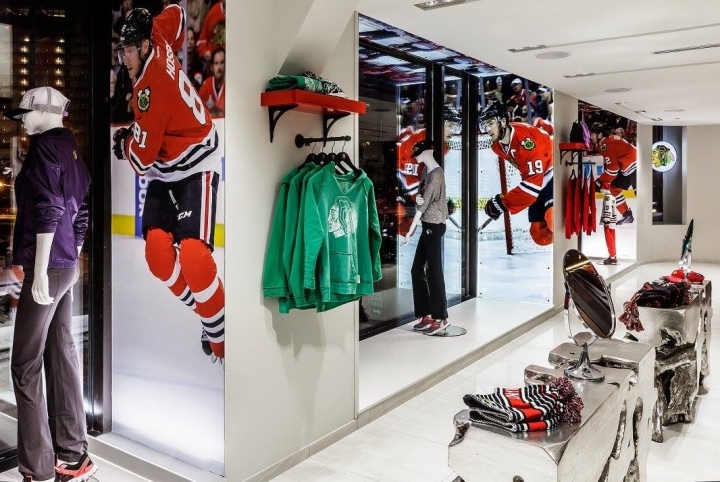 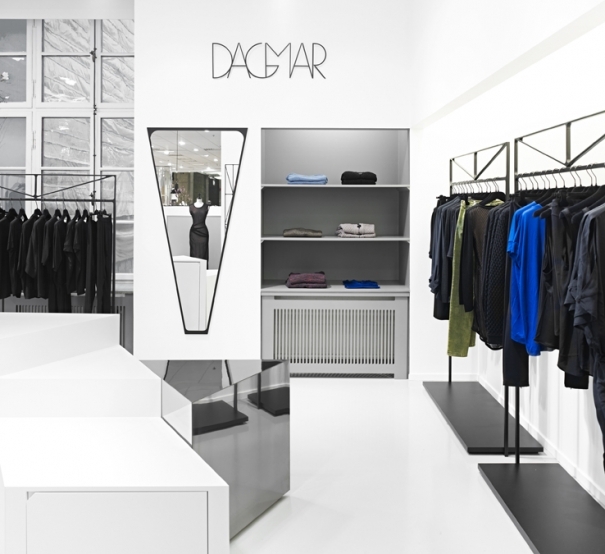 “You can select the background image – either on the ice or in the locker room – and you can literally have your photograph taken with that virtual image of the player, in the scene you want, then email it to yourself right there in the store,” says Julie Babcock, design manager, Chipman Design Architecture.